Camping is a time to relax, unwind and unplug but sometimes our phones and tablets can enhance family learning and fun out in the wild. Here are the 7 Best Camping iPhone Apps, Android and IOS for Families to try out on your next camping adventure. Before you even get to the campground, the KOA Camping App is incredibly cool for parents looking to plan a family camping trip. 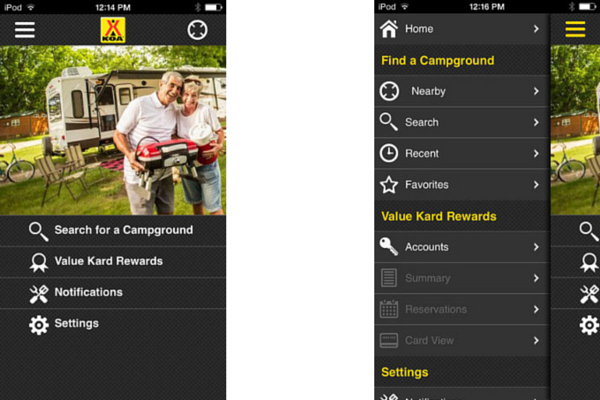 The app allows you to search campgrounds by city, state/province, attractions and most importantly current location. It also allows you to book on the go. You can reserve a campground or cabin within the app and also find deals, directions and look up camp activities for kids. As a mom who is on the road a lot, I also love the emergency notification feature that sends out alerts about road closures, storms or other emergencies from the campgrounds where you have made a reservation. It’s definitely my go-to camping iPhone app for planning our next adventures. 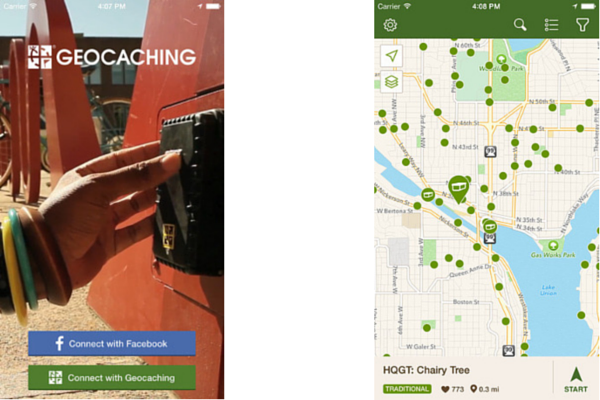 Geocaching is essentially an outdoor treasure hunt using the GPS on tech devices. Families use GPS coordinates and try a find a geocache (usually a small box or bag) hidden at coordinates. The geocache can be under rocks, dirt, or even water or hidden in tress etc. The kids and I have been geocaching for years and we absolutely love it. Three rules to keep in mind for beginners are: (1) if you take what is in the geocache you must leave something of equal or greater value; (2) you need to record your find in the geocache logbook; and (3) when you get home also record your find on the geocache.com website or do it through your app (helps people know its there and track if it goes missing). Once you have found a few geocaches, bring one along to hide while out camping for someone else to come and find. This camping iPhone app takes my family from regular city folk to adventurous animal explorers instantly. 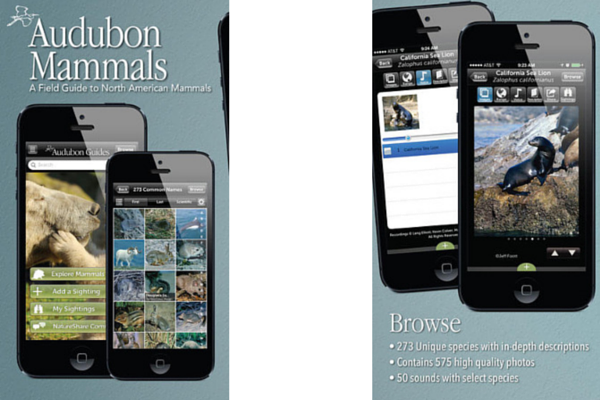 Its loaded with tons of photos , info, maps and more to help you identify animals and their tracks (and yes even poop). I love that with this app we can find answers together instead of my usual tactic of just making one up. Once you successfully track an animal you can add them to your map and take notes in the journal section which can be shared on Facebook. 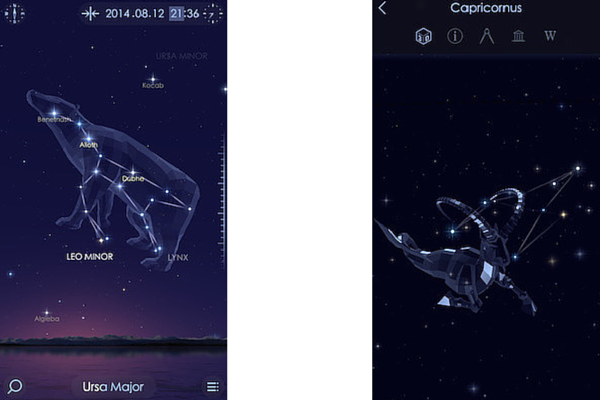 For families interested in stars and planets, Star Walk 2 is an incredible app. When you hold up your phone and point it at the sky, the app shows you the stars that can be seen from where you are. Using the GPS features of the phone, you can hit search and the app will find stars, constellations and satellites in the sky and point you where to look. My kids love the 3D cartoon images of the constellations that show up. 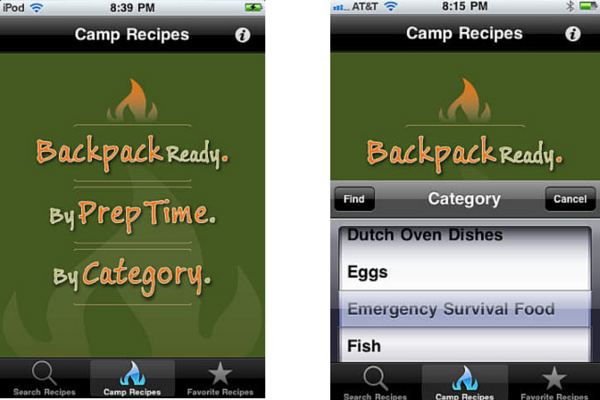 Camp recipes is the perfect meal planning app for camping. Over 700 recipes can be found on this app listed by category, cook time, ingredients and even emergency survival foods. It’s not all meat and BBQ recipes but includes some great vegetarian recipes and desserts. The database for the app is stored within the app on your phone meaning you don’t even need a signal to use it. Coleman, the camping gear company, offers a similar app for free that has less recipes and is very commercial but a good alternative if you don’t want to fork out the $2.29. Still, for dinners round the campground this camping iPhone app takes the cake…or s’more. The SAS (Special Air Services arm of the British Army) Survival Guide was written over twenty years ago by a former SAS soldier and instructor. 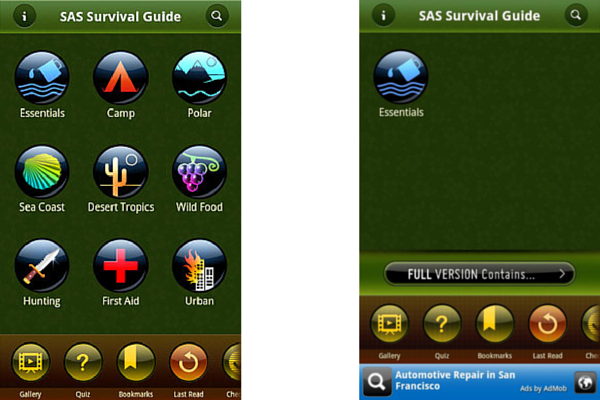 The book has now been transformed into an app that gives you survival skills on the go. The app includes the full text of the bestselling book, 16 videos of survival tips, a morse code signalling device and survival checklists to name a few. Most importantly and probably most relevant is the detailed First Aid section that will cover anything from bites to poisonous plants and burns. Before downloading this app, you need to know that its only recommended for kids over 12. But seriously, didn’t your parents scar you for life way before that? 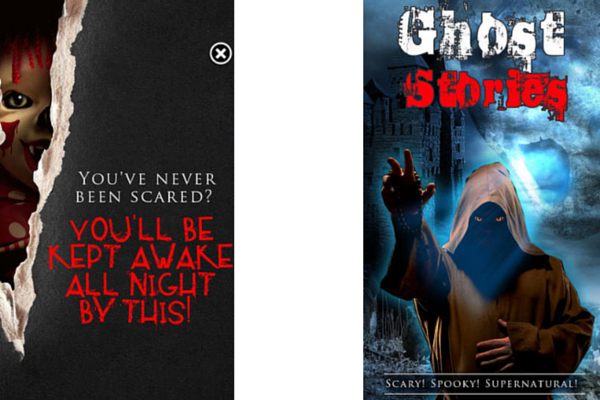 I didn’t find the collection overly scary and loved the sound effects. A great addition to my collection of camping iPhone apps. 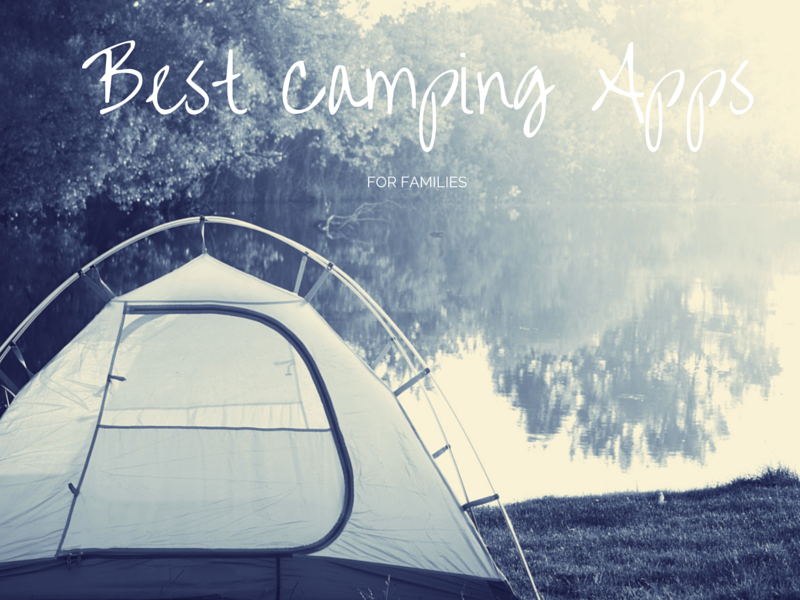 Are you favorites camping iPhone apps included in the 7 best camping apps for families? Comment and add any apps you wouldn’t go camping without. This is fantastic! Especially because several of them are great not just for camping but just traveling in general. I’ll have to Pin this! Thank you for putting this together. I love the night sky app- we used a similar one when we visited Honduras and it was amazing. I’m going to try the camp recipes one next time I go camping. Great list.